So, what is UWRF (Ubud Writers and Readers Festival) ? Well, it’s a literary festival, where writers/authors and readers meet, sharing stories, doing any workshops (literarty or cultural workshop), any special events, performance, and etc. 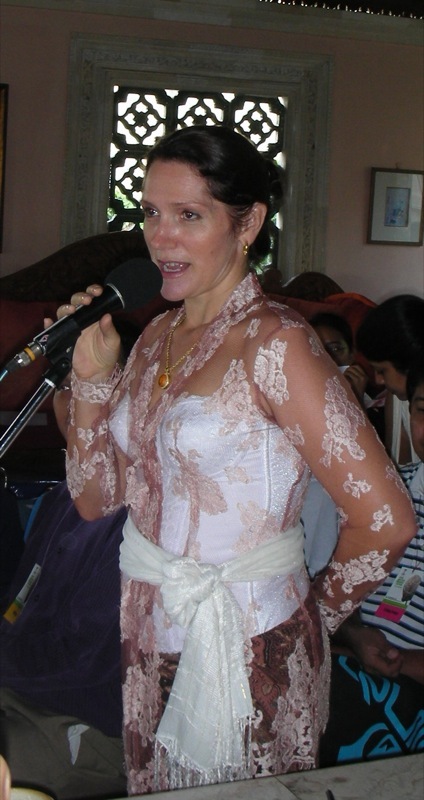 This festival was held by Janet de Neefe, as a festival to heal Bali after 2004 bombing tragedy. However, the response of the participants were terrific that until this year, it is held anually around October in Ubud. Main Programs: the programs listed here are seminars where the authors share their stories about anything (any specific topics). Special Events: this category consisted of many special events, such as literary lunch with many famous authors, long table lunch, literary breakfast, etc. Workshops: in workshops, many great authors will give half day or full day workshops. Well, to let you know how hectic the UWRF will be, especially for readers like me, which i find very difficult to choose any program I want to join. So mucchhh great seminars that I want to attend all of them, but I can’t divide myself into 2-3 copies of me LoL. I will go to Ubud tomorrow (5 oct 2010) to make sure I can attend the very first workshop on 6 Oct morning, although the official opening party will be held on 7 Oct. The old adage Show Don’t Tell is enough to drive a person crazy! That is, unless they get the thrill of scenic splendour that comes from doing precisely that! This is one of the most heard about and (probably) least understood elements of writing. Join prominent editor Shelley Kenigsberg and author and editor Selena Hanet-Hutchins for this comprehensive workshop that will help you get the gist of what it is and how to apply it to your work (fiction, non-fiction, long pieces, short pieces). Is it always true that we should show not tell? Is it okay to sometimes tell what’s happened or will this just give the reader a ‘blueprint’ of the novel? How does ’Showing’ and ’Telling’ relate to scene-shaping and word choice, or dialogue? How can it help a writer craft a marketable novel or non-fiction work? All these questions will be answered … and more. Famed traditional healer Jro Mangku Made Subagia, SH M.Phil., and his senior disciples at Siwa Agung Jagadhita, will hold a mass healing session for local residents as well as international guests. His methods are based on Bali’s esoteric teachings on divine energy, which emphasise the importance of balancing spiritual awareness with physical fitness. Feel free to participate to have yourself checked for physical or spiritualrelated illnesses. All are welcome to attend this free event. Fascinating research in three parts: widow sacrifice, slavery and opium trade in pre-19th century Bali. Although the Dutch abolished widow sacrifice, slavery was embraced by the V.O.C. for many years as a means of recruiting soldiers to fight the battles necessary to colonise and protect the archipelago. The lucrative opium trade helped finance colonisation, aided by new laws to ensure a Dutch monopoly. Rather than weakening the resolve of the indigenous Balinese, this helped galvanize their revolt against Dutch colonial rule. Festival Friends are invited to join us for the Gala Opening at Ubud Palace, in a cultural festivity to mark the beginning of the Festival. Tickets to this event are limited and highly sought, so book early. Includes canapés from Ubud’s finest hotels and restaurants, refreshments and entertainment. Festival Friends only. 19.30 – 21.00 Special Event – Tribute to Gus Dur Abdurrahman Wahid, former President and one of Indonesia’s greatest statesmen and thinkers will be remembered at the Festival’s annual Tribute Night. Join daughter Ina Wahid, biographer Professor Greg Barton, and performers as we pay homage to the beloved ‘Gus Dur’, remembered as icon of religious tolerance and understanding. Supported by Pak Dedi Panigoro. Spiritualists will perform the ancient ritual of Agnihotra to pray for the universe as well as for the success of the Festival. A beautiful ceremony involving a consecrated fire, beautiful offering and sacred chanting, Agnihotra was initially a Vedic ritual carried out by Hindu followers. Nowadays it has transformed into a non-sectarian ritual for the healing and purification of the universe. All are welcome to attend this free event. Janet De Neefe opens the program of panel sessions and welcomes readers and writers to the four packed and inspirational days that will follow. Most culture vultures depend on well-informed critics. So what are the vital ingredients of an engaging, authoritative arts critique? And how do you avoid the trap of comparing apples with oranges? In this practical three-hour workshop learn how to compress facts, context and evaluation into pithy and persuasive reviews. Writers can communicate with their readers in ways never dreamt of even 20 years ago. What does this mean for creative processes? What will the explosion of the next wave of social media technologies bring? Our band of media experimenters, twitterers and bloggers discuss the future of writing with Kris Saknussemm. in the field of reprogaphy. On the origins and contemporary interpretations of the concept of Bhinneka Tunggal Ika, a phrase taken from the ancient Javanese text the Sutasoma, but one that is universal in its sentiment: unity in diversity. Celebrating the Festival theme Harmony in Diversity, theatre fireFLY proudly presents a physical theatre performance of Conference of the Birds, a play based on a 12 Century Sufi poem by Farid Ud Din Attar. With live instrumentation, storytelling, singing and dancing, this theatrical odyssey promises to be a rare treat for the soul. Bookings and info: www.theatre-firefly.com. 15% discount to Festival pass holders. Pop star Dewi Lestari, alias Dee, published the first part of her sci-fi romance Supernova in 2001, to runaway critical and commercial success. Dee talks to Pam Allen about her rise to literary success, and her most recent project, Rectoverso, a cross-platform project of 11 short stories and 11 songs. A free event for Festival Friends only! The Friends program is growing from strength to strength, and this is Janet’s way of saying thank you to the dear Friends who support us. Enjoy morning tea with Festival Founder and Director Janet De Neefe and her husband, Yayasan Director Ketut Suardana. A great way to meet fellow Festival lovers. It’s the question readers love & writers dread: “where do you get your ideas?” Three writers bravely delve deep and expose their inspirations. The Vietnamese diaspora has not only led to vibrant communities around the world, but to a diversity of literary voices sometimes grappling with issues of cultural adaptation and the burden of history. Join our panelists as they discuss identity, belonging and their sense of home. Award-winning novelist and sometime musician Louis De Bernières talks music, films and village life with Stephen McCarty, editor of the Asia Literary Review. End your day with Cate Kennedy and Marie Munkara, as they read to Jeni Caffin. stories by Lily Yulianti Farid. Bali’s Youth Corner brings a series of screenings called Exploring Indonesia, giving a portrait of who, how and why is Indonesia. This series brings to light contemporary social issues in this diverse nation, not only in order to encourage dialogue about solutions, but also to showcase the works of the young Indonesian filmmakers who worked on the films. It’s over to you. Come early, come prepared, or just make it up on the spot. To show you how it’s done and spice up the proceedings, we’ve bought together a diverse mix from international slammers – Omar Musa, Emilie Zoe Baker, Kamau Abayomi, Ezra Bix, 2009 Australian slam winner Sarah Taylor, and the 2009 Ubud slam winner, Kerry Pendergrast. Eighty-five percent of all books published are nonfiction. In this interactive, full-day workshop, learn the ins and outs of writing good non-fiction, and hear advice on getting it published from a seasoned pro. You can always write that novel you’ve been planning while collecting royalties for your non-fiction book. Join us for a night of fun and laughter as writers flock to one of Ubud’s famed laneways. Readings, reggae, and street culture, Bali-style, including performance by a children’s troupe of the muchloved Barong dance. And no Bali street celebration would be complete without the joyfully sensual Joged Bumbung, so get your dancing shoes on. Well, this is my plan. Some of them are still optional though. Just wish I can attend all the program and events arrgghh.. But that is the tightest schedule I can arrange, also considering what I’m interested to. Soooo, wait for my update on the event 😀 !!!! Welcome to Ubud thennnn.. So exciting!! !